Failing To Fill Will Create Green Hair! Bella Hadid, Lucy Hale, Meghan Markle, Selena Gomez…proof that rich brunettes can be crazy on-trend, and probably your clients’ brunette #hairgoals too. Don’t be surprised when one of your blonde babes comes in begging to go dark—and don’t skip this CRUCIAL step that is the difference between luxe-looking brunette or totally BLAH brown (or worse, GREEN!). Moving from Level 4 to Level 10 means lifting through tone, going from red to orange to gold to yellow to pale yellow. The tones lost through lifting are warm tones, so you must fill the hair with warm hues to go darker. Use an intensely orange/red formula first, then apply the brunette hues you’ve mixed up. 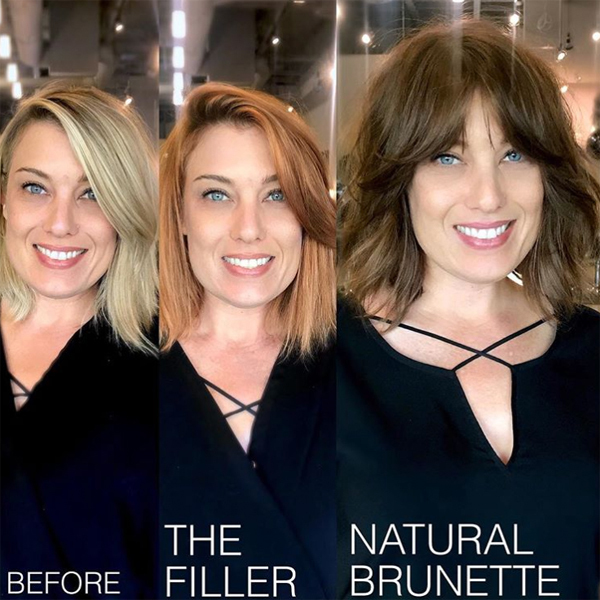 Here’s how color wizards like Briana keep their former blondes super healthy in their new lives as brunettes. Start the color service with Moroccanoil® ChromaTech PRIME, a quick-drying spray applied to the hair that helps increase color deposit and equalizes porosity for even results. Apply in quadrants. Mix up the filler formula. Focus on coppers, reds and warm tones—don’t use ANYTHING in the ash family. For example, to move from Level 9 to Level 5, fill with something in the Level 7 or Level 8 copper range. Some of Briana’s fave hues? 8C, 7C or 7CC. Process, shampoo with Moroccanoil Color Continue Shampoo, then proceed with the brunette formula(s) you create. At this point, using neutral or ash hues are OK! Finish with Moroccanoil ChromaTech POST (it seals in color with special technology that creates cross-links in the hair’s keratin structure, which traps color while forming a protective shield). Let the treatment process for at least 5 minutes, then shampoo and condition with Moroccanoil Color Continue to ensure superior color retention. Send her home with Moroccanoil Protect & Prevent Spray, which protects against color fade and brassiness and will keep her new rich hues safe in the sun. Ready for more healthy hair? Watch this balayage and babylights quickie!